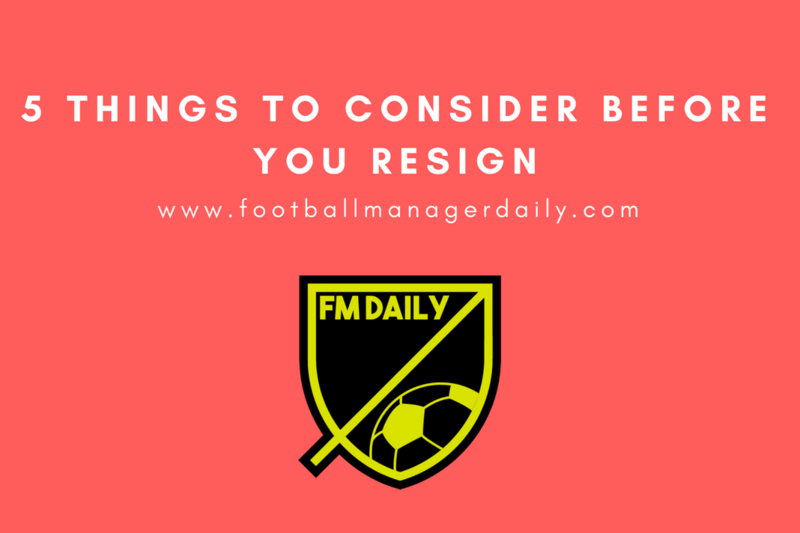 Every manager must agonise over this predicament – when is the right time to move on? In the real world, I don’t think it’s crazy to suggest the days of two men having a combined tenure of nearly 60 years in the English top flight are long gone. Back in 2017, the LMA told us that the average management reign in England is a mere 1165 days and he/she has a 30% win ratio. Almost all of us are better than that on FM18, surely? 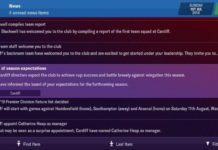 But, other than being sacked as I found out on FM18 BETA, how do you know when it is the right time to move on to pastures new, be it a new club within your save or an entirely new save? Last week, James Jones and I discussed this on our podcast and came up with the following 5 things that might be telling you it is time to move on and try a new challenge. We’ve all been there. 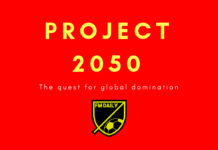 Something might have happened in the real world that has caught your eye and you’ve scribbled it in your notepad as a future save or, as luck would have it, that very same club has offered you a gig as manager. You are not that unhappy where you are, but your head has definitely been turned. You start imagining what it would be like to step in and save them or what it might be like to continue the fine work of the previous manager. You wonder if you could get the best out of their underperforming star. Rather than focusing on your tactics for the next few games you are checking out their fixture list and seeing how many points you could get off to a good start with. You start morphing into Marco Silva. As I said, there was nothing really wrong with the club you were managing but now the magic has gone because the grass might be greener somewhere else. Personally, I hate this scenario as I think I have only ever moved on from a club successfully twice mid-save. But my head gets turned just like yours – my advice would be turn them down, stay 22 years and remind everyone how loyal you have been once they start calling for your head. I, like many others, like to scribble down a lot of “goals” or “aims” when I start out on a new journey in FM. And, once in a while, I actually achieve them (it really doesn’t happen as often as I would like). What do you do once you’ve achieved everything you can achieve? I guess it depends where you have set the bar but if you did set out to take the lower level side all the way to continental glory with a bunch of homegrown stars and you’ve done it, there isn’t really much else you can do – time to find a new challenge in my opinion, there’s bound to be some club in need of your magic touch. Oh, I have been here. Sometimes it is because it is linked to #1 and I’ve done my best to resist the charms of another club but the damage has been done. Once in a while, it is because the save has become too easy (yes, that can happen every so often even to me) and I am not being tested. Or, more likely, my ‘killer tactic’ has been found out and I am on one hell of a losing streak. I am not a good loser. We all play FM for fun, right? If the fun has stopped, do not stop – just find a more fun challenge. Don’t pretend you don’t do this. I know I am not the only one that has conversations with his players on the toilet, works out my tactical approach for the next game whilst trying to get to sleep and holds press conferences in the shower. If you have worked out what you are going to say to the fans on the day you might leave several times over then it is definitely time for you to leave. Open up the job centre and see what is available, nobody will judge you. I envy these folk. They get FM18 on the day of release and they only change club or save when FM19 is launched. They don’t suffer from any of the above and they are able to commit long-term. They pace themselves. They are in it for the long haul. They create dynasties. They end up managing their newgen’s son to the Ballon d’Or. I wish I could be like these people and know that the only time I need to move club or change save is when the next version is released. As I said, this is not a definitive guide in any way, just some ideas James and I threw around on the Regista FM Podcast recorded last week. 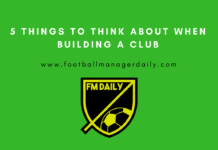 If you want to write for FM Daily, do get in touch. Let us know on @FMDaily_ if there is anything we have missed!